Designed to maintain power transmission, the motorcycle chain is critical to the delivery of a safe riding experience. With proper inspection, maintenance, repair, and replacement, your chain will ensure the bike rides steadily and safely. Therefore, you need to keep the chain in good condition until it proves problematic. When this happens, swap it almost immediately for a new one from any of the best motorcycle chains reviewed below. Old in style, heavy duty chains have no ring in between the inner and the outer side plates. As such, they are typically lightweight and relatively affordable to produce. However, it is hard coming across these types of chain on a modern motorcycle. If you ever do, then it will most likely be on low hp or off-road use bikes. O-ring chains sit smack between the chain’s side plates. This means that they create far less friction in comparison to metal-on-metal. They achieve this by pooling lubrication right next to the inner plate. By so doing, the life of the chain is significantly prolonged especially in comparison to the standard chain. Therefore, you can easily expect to get 12,000 to 18,000 miles out of an O-ring chain that’s well maintained. The last among the motorcycle chain types, x-ring chains are a more modern variant of the O-ring chain. They use the typically X-shaped piece of rubber in between the bike’s side plates. Manufacturers suggest that this type of design enables the chain to hold onto lubrication better while delivering more than 40% life to the chain. The reason behind this unusual design is that X-ring chains are unlike their circular O-ring counterparts. This is in the sense that they come with multiple pools of lubrication and points of contact with the side plate. In general, however, X-plates tend to cost more than O-ring chains. That said, they are becoming more common and quite affordable with each passing month. So, what should you look for to get the best motorcycle chain? How should you go about your search to ensure that you end up buying the highest quality for the most affordable price? With regards to investing in a chain, consider the chain type, the ring type, and the total number of links. 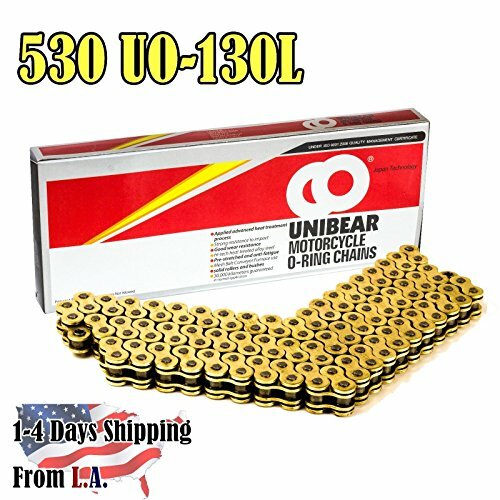 In general, you’ll typically have to make a choice between 530 and 520 motorcycle chain. Most chains you will see will have a 530 or a 520 number embedded. This number denotes a measurement of the chain’s size. The first number, which is almost always a 5 these days, denotes the length of the pitch right in between the pins. As such, this number is used to show buyers how big the links on the chain are. Some time back, chains started with a four but this is no longer the case. The second number, on the other hand, denotes the total width of the chain pins. This means that you get more thickness with a 530 chain than with its 520 counterparts. However, if the sprockets are changed, then you can use both of these types of chain interchangeably. There are three types of rings on motorcycle chain: x-ring, non-o rings, and o-ring. The oldest are the non-o rings that are quite in vogue at the moment. After they had stopped being the standard, the non-O ring was replaced by the O-ring. This type of ring is expensive to produce but is typically better sealed against dirt as well as being a whole lot tougher. The last type of ring is the X-ring which is even pricier. This ring type is, however, quite durable and will cause less friction on your bike’s chain. Less friction, in this case, almost always leads to better performance. Last but not least, you might want to understand how many chain links your motorcycle needs. Chains range from 80 all the way up to a maximum of 130 links. That said, most of the bikes you will come across will typically have around 110 links. 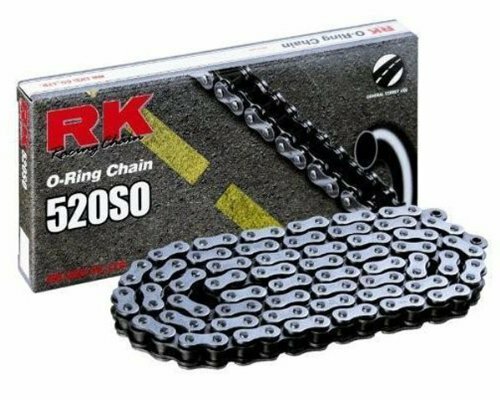 Some manufacturers of bike chain offer a wide variety of lengths while others only sell 130-link chains that you will have to deduct from to get the overall number of links you need. However, as you modify the motorcycle chain, keep in mind that although removing the links is easy, adding extra links isn’t. 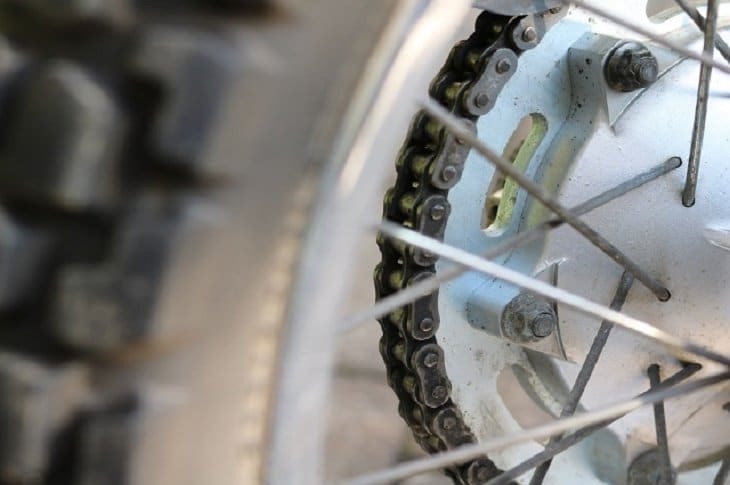 If you manage using your bike chain as you are supposed to, then the roller chain will revolve around the rear and front sprockets – which are a crucial part of the entire chain drive system. By lubricating your motorcycle chain, you will ensure that the rollers and links continue working efficiently both with each other and with the sprockets they connect with. However, you need to keep in mind that lubricant will cause your chain to accumulate a buildup of grime and dirt. This is why you must always ensure you only use fresh grease every single time. You should also adjust the motorcycle chain because it tends to stretch after spinning around the sprockets whenever you are speeding on your bike. The only advantage you stand to gain from not adjusting and lubricating your chain every once in a while is that you can replace the sprockets and chain more often. This will, therefore, increase your bike’s mechanical capabilities. Last but not least, remember that chains deteriorate – even with regular lubrication. To this end, you need to adjust them to make up for the stretching they undergo. That said, you should get replacement chains whenever you have a knack that your bike isn’t handling quite as well as it did when you first bought it. So, there you have it – the best motorcycle chain you can find. 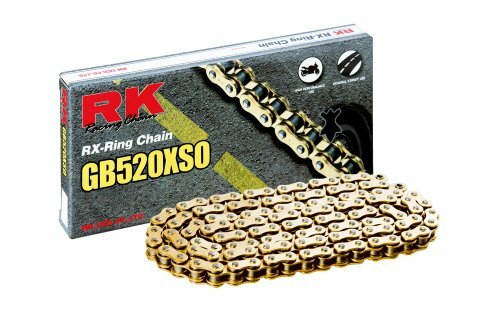 Although each of these chains offers great value in one way or the other, we have a particular preference for the RK Racing Chain GB520XSO-114 114-Links Gold X-Ring Chain with Connecting Link. 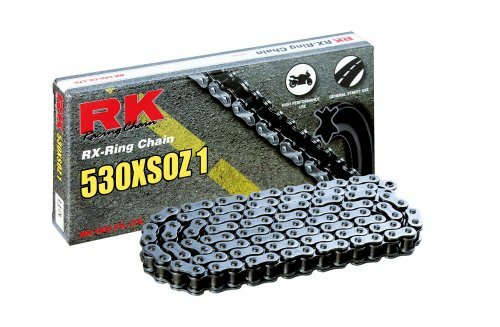 The advanced X-ring design, the affordable price, and the durability of this chain deliver the kind of service that will have you speeding for miles on end without having to get a replacement chain. If you liked this article, and would like to know more about other products, please leave us your feedback in the comment box below. Until next time, enjoy!